So you’re an urban designer of some kind, and you just won a job to redevelop a site within a stunning city. It’s stunning because it holds centuries of heritage and is already a great place with many things to do. What do you add? How do you design something in a space for a city that is already great? Wouldn’t something new be almost offensive? What do you do? I’ve seen this happen a lot in Europe. But out of the successful ones, one element stands out the most – reflection. And that is exactly what he did with the Miroir D’eau – the focal point of the entire riverfront site. His 2009 design became extremely successful and managed to draw many people back to the riverfront from which their City originated. At the Miroir D’eau you will find a long elevated base plane with a thin layer of water. Sometimes, small fountains embedded inside the pavement shoot water out of holes accross the platform, but when they don’t, people often walk accross it and play in it. Not only is this place a beautiful, unique, interesting and interactive nodal & destination point, but it also clearly reflects the historic buildings behind it (Place de la Bourse) into the water, doubling its beauty. 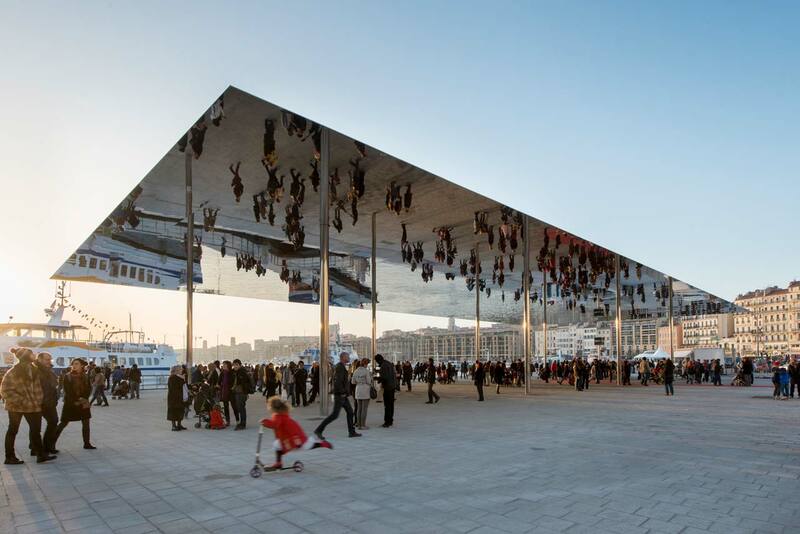 2013 has brought a new site to the map – take a look at the Vieux Port Pavilion in Marseille, France. Architects Foster & Partners designed this reflective stainless steel canopy to reflect the city’s UNESCO World Heritage port. The overhead plane creates a public room, a defined space, and a sense of enclosure – all elements that entice pedestrians to divert their path in order to experience walking under it. If all else fails, the reflection, which creates an illusion of people walking upside-down on a nearly-invisible cieling, is sure to peak their curiosity. “It’s quite literally a reflection of its surroundings – its lightweight steel structure is a minimal intervention and appears as a simple silver line on the horizon” – Spencer de Grey, head designer. We have also seen examples of reflection in North America. 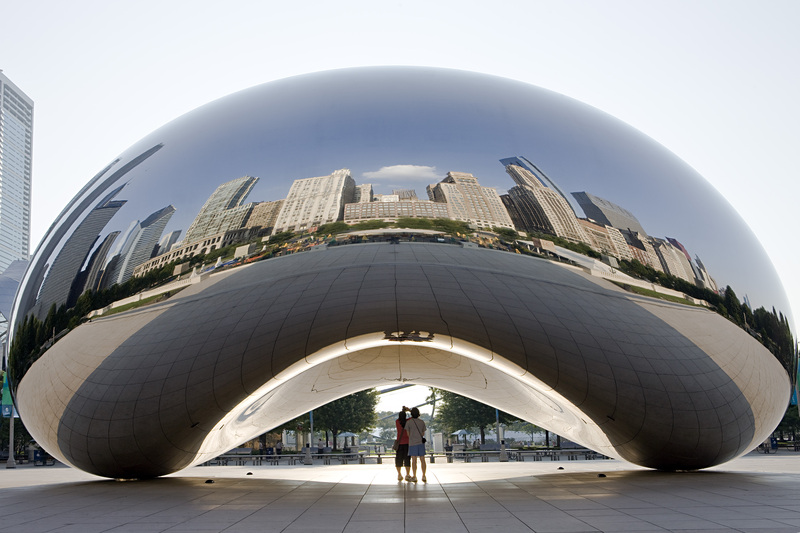 Anish Kapoor designed the Cloud Gate sculpture, better known as the ‘bean’ in Chicago. This stunning piece is now a widely recognized landmark in the City, and visitors flock to visit it as a destination point. People take interest in its odd shape. The reflective stainless steel surface reflects and distorts the Chicago skyline and visitors experience a fun-house mirror effect when walking around and through it, observing their reflection. Chicago reflected, yet projected through a new lens. Charles Wright Architects won the 2012 far north Queensland Awards Auilding of the Year with their mirror-clad Cairns Botanic Gardens Visitors Centre design. The building was designed to be invisible amongst the surrounding trees of the gardens in order to blend somewhat seamlessly with the beauty of the site’s natural state. 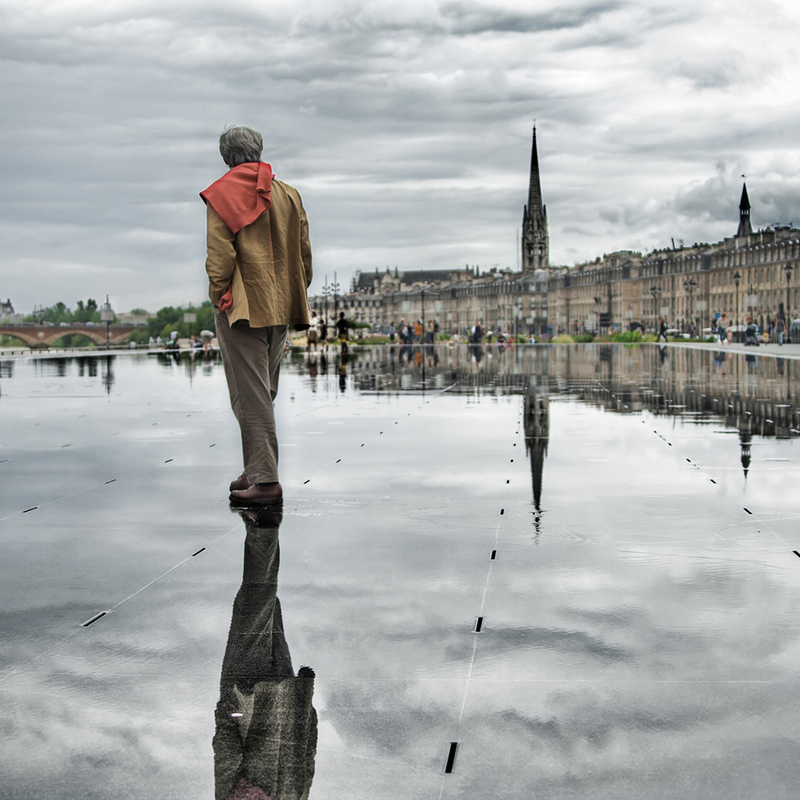 Reflection in urban design around the world has become a modern trend. Its impact is both aesthetically pleasing and respectful to existing settings. Wow I just came across your blog and I’ve fallen in love! I myself am passionate about urban design and I want to study it next year! I really want to live/work in France so the works from Bordeaux and Marseille that you wrote about were really fascinating to me. Well done! Thank you so much! You sound just like me! Haha. Glad you liked it. That you are an incredibly intelligent personal! SOUL OF THE COMMUNITY: What Makes People Happy With Their Communities?